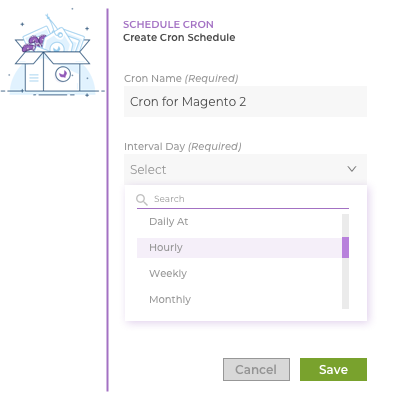 Akeneo Cron Scheduler: With the help of this module, you will have a UI option for easily creating cron jobs in Akeneo. Akeneo Cron Scheduler allows cron jobs for daily, weekly, monthly basis. What is the need of Akeneo Cron Scheduler content? Most of the eCommerce merchant manage their work with Akeneo. Sometimes it happens that they forget to export the product to their eCommerce channel or in the CSV files. It creates a lot of issues for them. 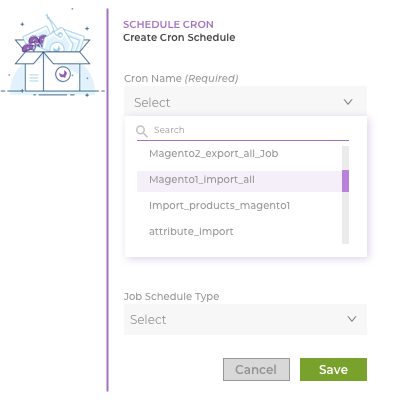 Akeneo Cron Scheduler module helps the customer to schedule a cron export job in Akeneo. A merchant can set the cron on the hourly, monthly, daily, and weekly basis. If a merchant forgets to run the job profile then it automatically runs the export job. It will automate your process and save time for extra export work. With this module, you can automate the export process. You can set a cron for the export and import profile. You can set the export profile in cron and it will run at the scheduled time. 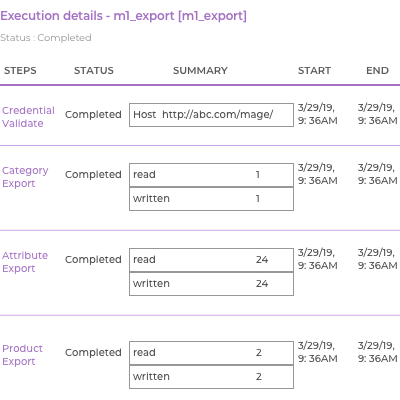 With this module, you can create and schedule the monthly, weekly, and daily cron schedule for export and import profile. With this module, you can also Activate/Deactivate and delete an existing cron. You can change the export profile under it. With this module, you can create the Daily, Hourly, Weekly, and Monthly Cron scheduler job in Akeneo. It helps you to set the export process in a specific time. Daily - If you will select the interval Day daily then you will get the option to run the export/import job with the time like 1 am, 13 pm. Hourly - If you will select the interval Day hourly then you will get the option to set the export job with hourly like after 1 hour, 4 hours. Weekly - If you will select the interval Day weekly then you will get the option to select the export time with the day like Sunday, Monday. Monthly - With this option, you can select the interval day monthly. You will get the option to select the month date in interval time. With this module, you can create a cron job for CSV/eCommerce export. After setting the interval day and interval time in a cron Scheduler, you can choose the export profile. You can select the export profile in the Job profile name. You can set the cron for the CSV/XLSX and eCommerce export profile (if you have already installed any eCommerce connector like Magento2, Shopify). You can set the export profile for CSV/XLSX files. You can set the export profile for eCommerce Channel. The data will export at schedule time. You can track the export profile with the help of the terminal. It helps the merchant to summarize their work within a scheduled time. With this module, you can create the cron job in Akeneo with the UI. It saves more time and additional work to run the export job after a time period. You can create and configure the export job with the User Interface. You will also get the option to change the visibility of the cron job like active/inactive. You can filter the cron jobs in this module with UI. For it, you have to choose the option Activated(Yes/No). If you will select "Yes" then it will show active jobs and if you will select the "No" then it will show not active cron jobs. You can change the visibility of the cron job like Active/Inactive. You can delete a cron job. You can also create an unlimited cron job profile. You can also filter the active/ inactive cron jobs. Nowadays, every merchant doesn't want to like the manual job in eCommerce. It takes more time, effort, and cost to do the things manually. With this module, You can automate your product export feature. You can export the products from Akeneo to eCommerce channels and CSV/XLSX files. After selecting the export profile, you will get two options in the cron scheduler configuration. Export as Normal Job- If you choose this as job type so it means one job run at a time. Any other job will not be executed until you get the response of previous jobs. Export using job Queue- If you choose this as a job type. You can run many jobs in parallel. You don't have to wait for the response of the previous jobs. You can automate the process with the help of Akeneo cron job. Export products with the help of cron job to different e-commerce channel. You can set a cron scheduler for any e-commerce channel. Webkul is the largest supplier of building a growing list of Akeneo extensions (add-ons and connectors). You can check out below modules for further enhancing the capabilities of your Akeneo PIM and managing your catalog better. Horecaworld -is the fastest growing Catering equipment and Home Appliances company in the Netherlands, Europe. They sell catering and kitchen related products for a long time. Now, Horecaworld started the selling of goods online. Horecaworld provides the free shipping of the products in the Netherlands and Belgium. They delivered the products within 24 to 48 hours with a minimum one year warranty. Horecaword started its e-commerce business on the Magento1 platform. Horecaword deals with a large number of products. Nowadays, it is difficult to manage a large number of products manually. It takes a lot of times and cost to manage a large number of products manually. For more click here. Did you buy Akeneo Cron Scheduler? What is the main purpose of this module? 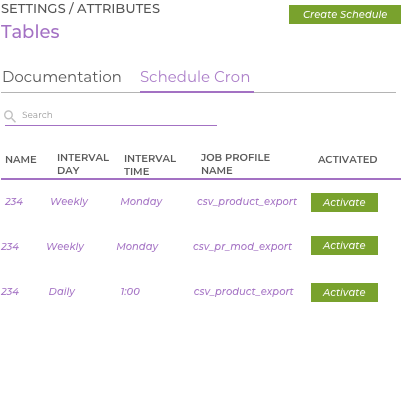 Akeneo Cron Scheduler module helps the customer to schedule a cron export job in Akeneo. A merchant can set the cron on the hourly, monthly, daily, and weekly basis. I currently don't know how to install Akeneo Cron Scheduler module. Can I buy this connector in this case? If you have purchased this module and don't know how to install then you can follow the user guide (https://webkul.com/blog/akeneo-cron-scheduler/). You can also purchase the module installation features. In this case, we will install it on your server and assist you. Is this module work with all Akeneo eCommerce connector? Yes, this module works with all our eCommerce connector(Like Magento2, Shopify, PrestaShop, BigCommerce, etc). Can we see the export process in process tracker? No, you can't see the export process in the process tracker. You can see it with the terminal. + Now you can schedule your cron job at the minute basis. - Create Profile Model UI Fixed. + Schedule your cron job at the base of daily ,hourly weekly and monthly. + UI based Cron job ,perform delete , status change operations on cron jobs.